The other day I was roaming the Internet; link here link there, tweet here tweet there, and I stumbled upon a very nice game called Geocaching. Geocaching, simply, is a game in which players hide items in any place in the world, and the other players should find, yes…Treasure Hunt. But the fun part is it’s Global, and the GPS is your primary tool! The players who want to hide an item, should first label it and give it a unique identifier, then record the coordinates (longitude and latitude) of the place they hide it in, and finally they should post the information along with the coordinates on the game’s website www.geocaching.com. 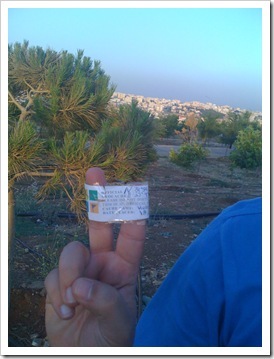 And I was lucky enough to know that there are 17 geocaches in Jordan! 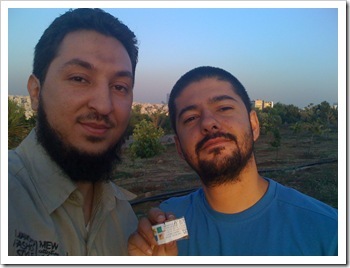 below is an image of my first geocache quest result with my good friend Tamim Salem, using my iPhone’s GPS. The item was broken and this paper is the only thing left. Wonderful game, I think best part when you reach the spot a recognize that some one reached the exact spot before you! You know Husam, the best part is when you check the log on the internet, and find someone else found it AFTER you did. it’s a long nice chain.